Pre-heat the oven to 400 degrees, and line the baking dish with foil. You will start by preparing the peppers and cutting off their tops and deseeding them. Place just the peppers alone into the baking dish and bake for 10-15 minutes until soft. While the peppers are in the oven, defrost the spinach if you are using frozen and squeeze the water out of it. If you are using fresh, wash and pat dry. Pull the peppers out of the oven and add in the spinach to the bottom of each pepper. You can also add in your other items such as onions or mushrooms if you are using those. Spices can be added here too. 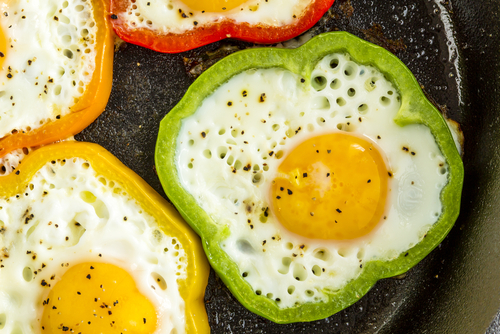 Once the bottom of the pepper is stuffed with your filling of choice, crack one egg into each pepper. Place the peppers and their filling back into the oven uncovered for 20 minutes. Let cool, and enjoy! Yields 4, serving size is one. this is unclear – do you eat all 4? just 1?